Come out to Cope Environmental Center and experience the beauty of nature! CEC hours of operation will be changing for the month of January – We will be CLOSED ON SATURDAY’s until February 2, 2019 – at which time we will host a special Groundhog Day program! Don’t worry about missing out on your daily dose of nature, as our trails will still remain open, dawn to dusk, every day. The following is the schedule for upcoming events and programs in January. For more information, call us at 765-855-3188. 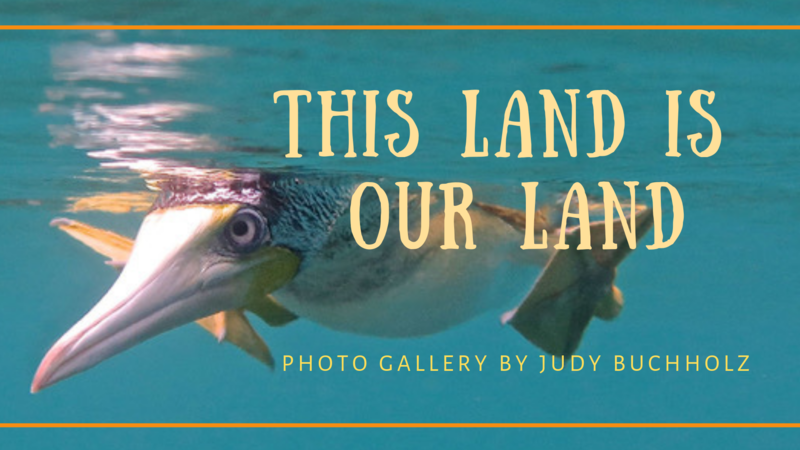 A photography gallery is on display at Cope Environmental Center: This Land is OUR Land by Judy Buchholz. Judy’s love of all things nature (birds, bugs, butterflies, and more) and her love of photography mesh into a fulfilling hobby. She also has great appreciation for outdoor spaces — National Parks, State Parks, City Parks and local environmental spaces. She sees these as treasures to be cherished, respected, supported and used. This land is OUR land. Protect it! All art work is for sale and 30% of the purchase price goes back to Cope Environmental Center. Thanks to the support of Reid Health, CEC will kick-start another season of the Get Outside Challenge! This 10 week initiative aims to challenge our community to spend more time being active outside! This challenge is for anyone and everyone who wants to become healthier and happier in the great outdoors this winter. Plus, there are prizes! It’s free! Kids can participate too! Just track the amount of time you spend active outside between January 14 through March 25. Start the year off right with a happier, healthier you! For more info on what this initiative is all about and how you can participate, please visit our Get Outside Challenge page! A small wind turbine can provide anywhere from 40%-90% of a household’s or small business’s total energy needs. It is even possible that your utility company will purchase excess electricity generated by your system providing a new stream of revenue! (source: Rocknoll Energy Systems) Are you ready to get “off the grid”? Are you interested in installing a small wind turbine on your property? Come out to CEC’s Sustainable & Attainable program to learn about small scale wind turbines. Jim Yockey of Rocknoll Energy will be on hand to talk about the benefits of small scale wind turbines and Bergey wind turbines. Light refreshments will be provided. No RSVP required. Registration: Not required. Questions can be directed to Regan at r.lowring@copeenvironmental.org or (765)855-3188. Happy New Year! E-waste recycling is back for 2019! Start the year off right by recycling your old electronics so that parts can be re-purposed. Don’t let useful parts go to waste in the landfill. E-Waste Recycling happens on the fourth Saturday of every month (except holidays) from 9 a.m. to noon. Date & Time: Saturday, Jan. 26, from 9 a.m. – noon. Did you use a live Christmas tree this year? Don’t know what to do with it after the holidays? CEC will be offering free Christmas tree recycling until the end of February 2019. Don’t let your tree go to waste! Turn it into mulch for our hiking trails! 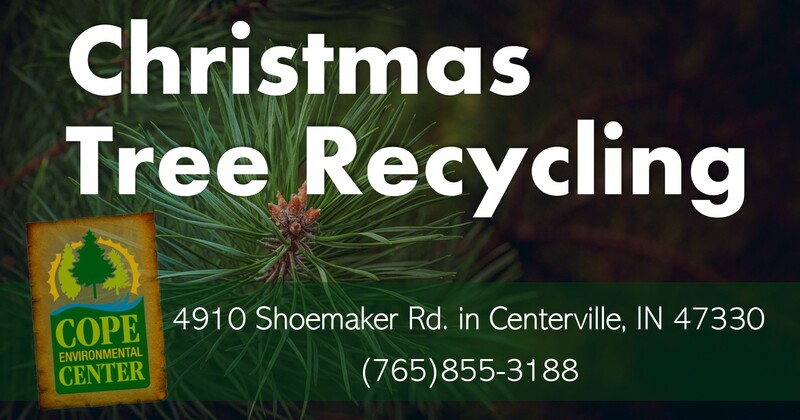 You may drop your tree off at our south entrance at 4910 Shoemaker Rd., Centerville. Make sure all decorations (lights, ornaments, tinsel, etc.) are removed before drop-off. Saturday, February 2, 2019 – Groundhog Day program from 10-11:30 a.m.
Saturday, February 9, 2019 – Family Maple Syrup Day from 9 a.m. to noon.